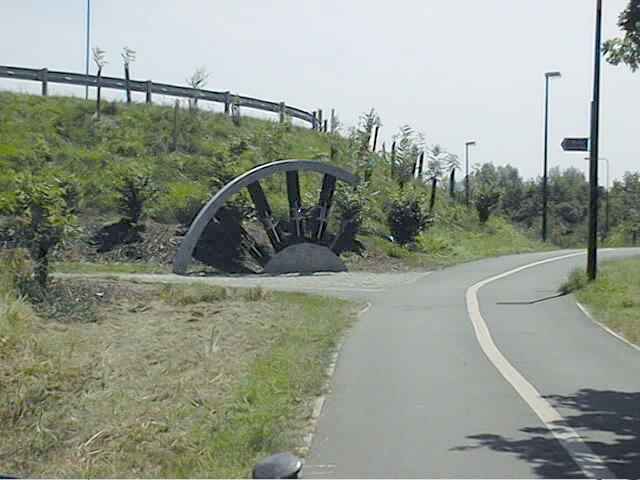 The wheel is a recent addition to the cycle track's sculpture trail. The spokes are made out of railway sleepers. I'm not sure why some of the spokes and a section of wheel rim are missing, possibly the sculptor didn't have a spoke length calculator, perhaps its what is known as artistic licence. Either way I can't help him much because wagon wheels work differently to wire bicycle wheels: A wagon wheel supports the hub on the lower spokes which are in compression, but bicycle wheels support the hub from the upper spokes which are in tension.